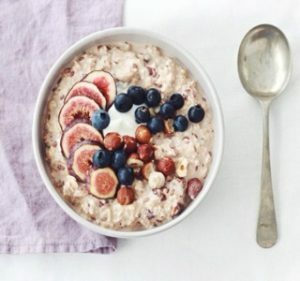 Bircher muesli is a fabulous breakfast – great for the gut and keeps the blood sugar stable. It can be varied according to individual tastes and is easy to prepare. You can make a larger portion and keep in the fridge for two days’ breakfast or even use it as a packed lunch for work or school. Mix it all together to make a delicious breakfast. You can leave out the sour cream, crème fraiche or plain greek style yoghurt if you prefer. The soaked oats makes its own oat milk.